I made a new friend this summer. Jacky Faber is many things – fierce pirate, skilled sailor, cunning thief, loyal friend, talented musician, and… a girl. Mary “Jacky” Faber is left on the streets of London in 1797 after an illness takes her parents and sister. After watching too many fellow orphans be done in by the mean streets, she cuts her hair, dresses as a boy, and talks her way into a ship’s boy position on a British naval vessel. For more than 2 years she pulls off her “deception,” despite her maturing body and a blossoming crush on a fellow shipmate, Jaimy. During this time, she earns her nickname “Bloody Jack” after a skirmish with pirates, as well as a promotion to midshipman, before being discovered as female and packed off to a Boston finishing school. Things don’t always go well for Jacky – there are certainly darker elements to her story, as she must avoid lecherous sailors and the hangman’s noose – but she maintains a positive demeanor and always manages to “bob back up.” Readers will gain much in nautical terminology as well as historical facts. Bloody Jack is the first of a 12 book young adult historical fiction series which follows Jacky around the globe as she tries to make her way in the world and reunite with her beloved Jaimy. I am currently partway through the tenth book and will sorely miss Jacky when the series ends. 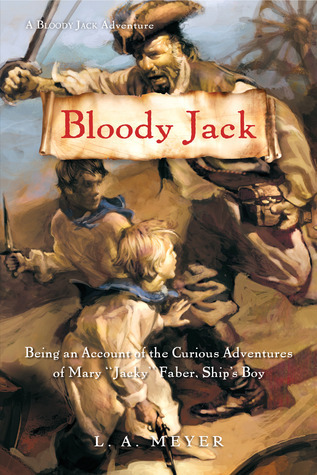 Meyer, L.A. Bloody Jack: being an account of the curious adventures of Mary “Jacky” Faber, ship’s boy. San Diego: Harcourt, 2002. This is absolutely one of my favorite YA series! I have listened to the series and Katherine Kellgren and she is a terrific narrator. I do pick and choose who I recommend it to because of some of the language and situations Jacky is subjected to. However, anyone who I think can handle it I recommend this series to!